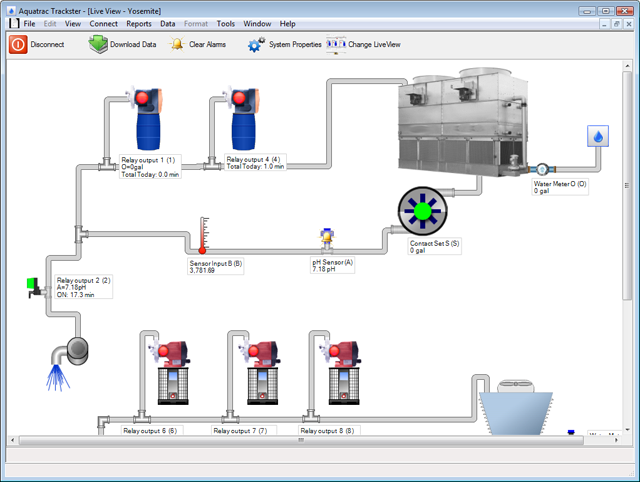 Trackster 3 is the command and control software for MultiFlex and Aegis Controllers for cooling towers and boilers. Multiflex and Aegis controllers may control multiple cooling towers or boilers or a mix of boilers, towers and closed loops. 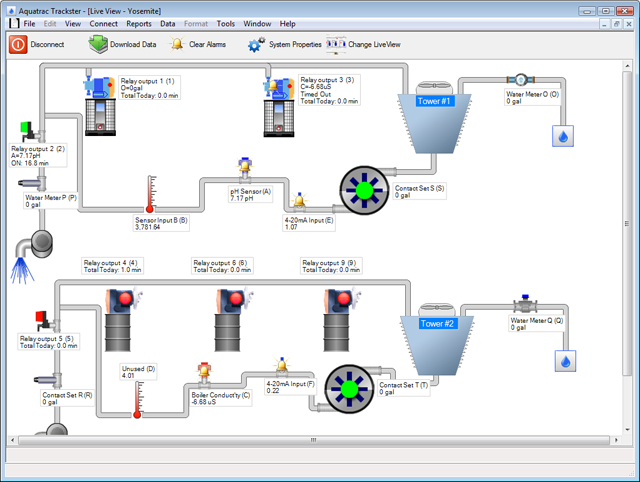 Trackster provides you with the tools to view and control the water treatment of both simple and complex installations in real time. Report generation, data import/export, manual data entry, alarm logging and controller networking tools fill up the Trackster toolbox. 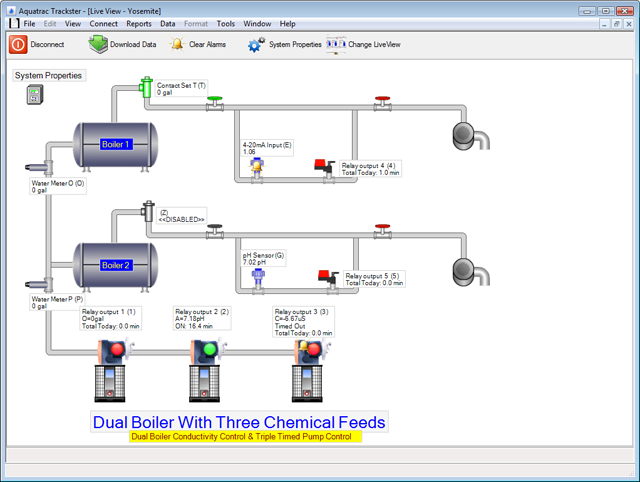 Use the tower and boiler Views provided with Trackster or use the view editor to move the pipes, pumps, valves, towers, boilers... to look like your site or sites. Import your own images/photographs to make your own custom LiveViews. Trackster allows you to watch as pumps and valves turn from green to red, conductivity increases, pH drops, flow switches ON, corrosion rates trend, biocides pump, water meters make-up and blowdown valves flash, feedwater temps fall and sulfite feed ramps up: - It's all visual and all real time. Site Structured Reporting Controllers are organized by Site; where a Site may be a physical location or all controllers and manual entry logs associated with one customer. Reports may merge data from all controllers from any site. In addition to connecting to your controller locally, Trackster 3 gives you the capability to connect to your controllers via modem and/or Ethernet. This means that you can be located anywhere in the world and still have total control of your cooling and/or boiling controls. Complete Maintenance and Configuration Toolbox Adjust setpoints, reset alarms, re-calibrate, switch inhibitor feed modes and biocide timing, span 4-20mA loops, monitor corrosion rates tank levels, tower and feedwater temperatures... Adjust water meters, set pager dial-out, switch pump control sensors. AutoPoll Historical Data and Alarms Trackster 3.2 supports two different types of AutoPolling - 1. AutoPoll Historical Data and 2. AutoPoll Alarms. 1. AutoPoll Historical Data - Automatically download historical data from controller's and optionally, email out the historical data to one or more Email recipients. 2. 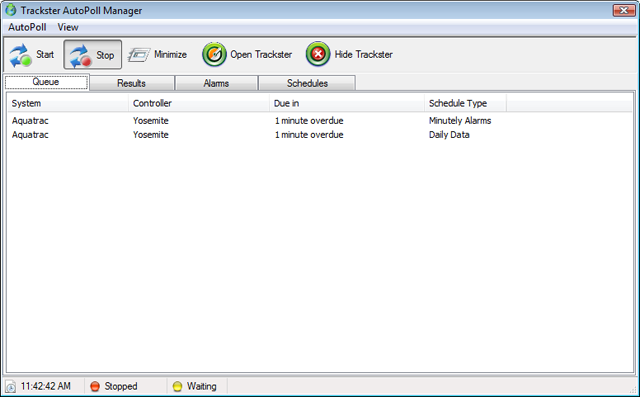 AutoPoll Alarms - Trackster will check for new alarms on your controller's. If one or more alarms are found, Trackster will email the information to one or more Email and/or Cell Phone recipients. Being notified via your cell phone can have you aware of any and all alarms from all of your controller's up to the minute! Note: With Trackster 3 you AutoPoll our legacy SmartFlex and SmartAS controllers for Historical Data and Alarms. After you download the data, you can use Trackster 3 to create and view SmartFlex and SmartAS reports. Combine multiple controllers and formula's into one report. 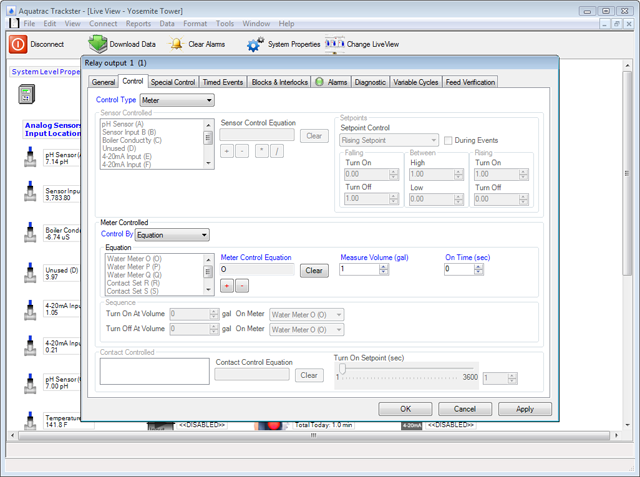 View sensor data with respect to control setpoints and/or alarms. Share your reports via Email. Export and Import Tools Export Trackster reports and raw data directly to Excel and other formats. Note: With Trackster 3 you can download historical data from our legacy SmartFlex and SmartAS controllers. After you download the data, you can use Trackster 3 to create and view SmartFlex and SmartAS reports. View and configure your controller with customizable LiveViews. How to export all controller data from Trackster 3 into Excel: This video shows you how to use Trackster to export all the historical data of one controller to Microsoft Excel 2007. After importing the data into Excel, this video will show you how to reformat the data (in the spreadsheet) in a cross-tab presentation. Variable Cycles Configuration: Demonstrates how to configure a relay (chemical pump) for a Variable Cycles application. Toggle Digital Input: Demonstrates how to configure a digital input to a Meter or a Contact Switch. Time Modulation Configuration: Demonstrates how to configure a relay for a Time Modulation application. 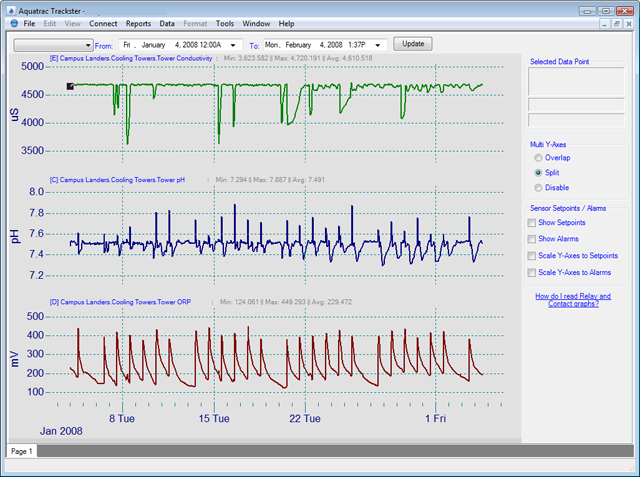 Timed Cycling Configuration: Demonstrates how to configure a relay (chemical pump) for a Timed Cycling application. Prebleed Lockout Configuration: Demonstrates how to configure a relay (chemical pump) for a Prebleed Lockout application. 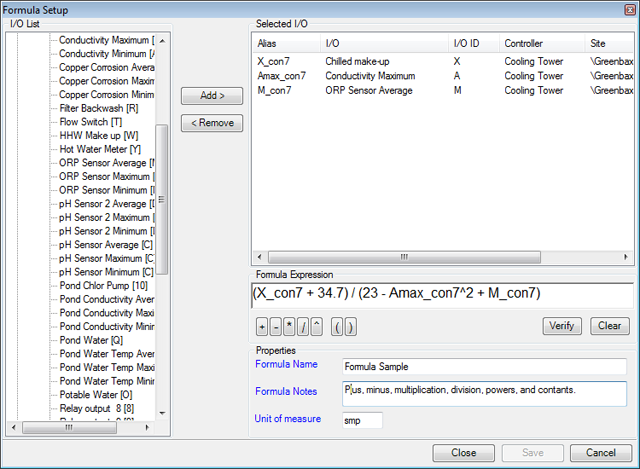 Percent Time Configuration: Demonstrates how to setup a relay (chemical pump) for a Percent Time application. Holding Time Configuration: Demonstrates how to setup a relay (chemical pump) for a Holding Time application. Captured Sample Configuration: Demonstrates how to setup a relay for a Captured Sample application. Bleed-Then-Feed Configuration: Demonstrates how to setup a relay (chemical pump) for a Bleed-Then-Feed application. Bleed-And-Feed Configuration: Demonstrates how to configure a relay (chemical pump) for a Bleed And Feed application. SMTP Outgoing Email Server Configuration: Demonstrates how to setup the email server settings. The email server settings are used when you setup AutoPoll to email out historical data and/or alarms. Import LiveView Image: Demonstrates how to import your own image into a LiveView. Run the AutoPoll Manager: Demonstrates how to run the Trackster AutoPoll Manager to start the schedules that you have created for Historical Data and Alarm collection. Enable/Disable Inputs and Outputs: Demonstrates how to enable and disable inputs and output on a controller using the Trackster software. Download Historical Data Via LiveViews: Demonstrates how to download historical data from a controller via LiveViews. Direct Data Download: Demonstrates how to download historical data quickly - The Direct Download procedure is useful for when you simply want to retrieve historical data from a controller without having to connect to the controller via LiveViews. Create a Custom LiveView: Demonstrates how to create a LiveView. 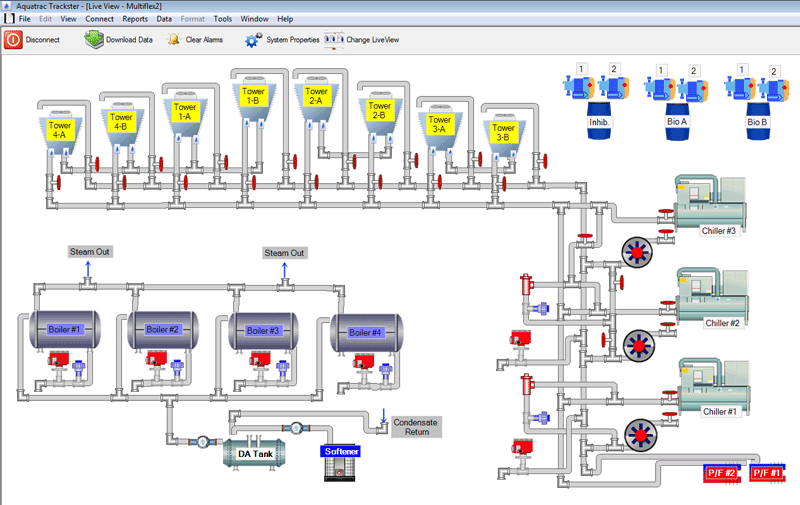 The concepts learned in this video will help you create a LiveView that is specific to your cooling tower and/or boiler system. Report Formula (Calculation): Demonstrates how to create a custom formula and then use that formula in a report. Configure Timed Events: Demonstrates how to configure a relay (chemical pump) to turn on/off based on Time. Configure Sensor Controlled Relay: Demonstrates how to setup a relay (pump) to be controlled by the values of a analog sensor (pH, ORP, Conductivity, etc). Multiflex Password Reset: Shows you how to reset all Multiflex passwords using an Upgrade Code. To receive an Upgrade Code, send a request to support@aquatrac.com and make sure you include the Serial Number of your Multiflex controller. Download Multiflex Data Via HyperTerminal: Explains how to download and capture Multiflex historical data using HyperTerminal. Configuring Trackster 3 Database Permissions: Shows you how to give all users Write persmissions (or Full Control) to the Trackster 3 database. This video is helpful if you are receiving an error message (Operation must use an updateable query) when attempting to add a System (or Site) and/or a Controller to Trackster Explorer. AutoPoll Historical Data Setup: Shows you how to configure AutoPoll to collect historical data from a controller. AutoPoll Historical Data is useful for when you want to automatically collect and import historical data into Trackster. Also, you can email out historical data to colleagues that do not have a connection to the controller. AutoPoll Alarms Setup: Shows you how to configure a controller for AutoPolling Alarms. AutoPolling Alarms will allow you to be notified via email and/or cell phone when an alarm occurs on the controller. Zoom-In On Report Data: Shows you how to Zoom In and Zoom Out on a report page. Zooming is useful when you need to need to see more detail on a trend. Open System Properties: Shows you how to open a controller's System Properties page. The System Properties page is where you can view and/or edit the controller's clock, diagnostic info, dial-out information, etc. Configure Meter Equation Controlled Relay: Shows you how to configure a relay to turn on/off based on the volume reading a meter. Configure Feed Verification: Shows you how to configure a relay for feed verification. Import Controller Data Into Microsoft Excel: Shows you how to import controller historical data into Microsoft Excel in a readable columnar format. Formula - DBNull Error Fix: Shows you how to fix the 'Conversion from type 'DBNull' to type 'Integer' is not valid.' error that may occur in Trackster 3 when creating a new Formula. This video shows you how to use Trackster to export all the historical data of one controller to Microsoft Excel 2007. After importing the data into Excel, this video will show you how to reformat the data (in the spreadsheet) in a cross-tab presentation. 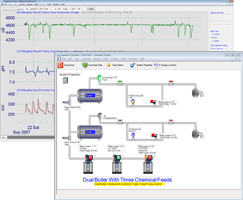 Demonstrates how to configure a relay (chemical pump) for a Variable Cycles application. Demonstrates how to configure a digital input to a Meter or a Contact Switch. Demonstrates how to configure a relay for a Time Modulation application. 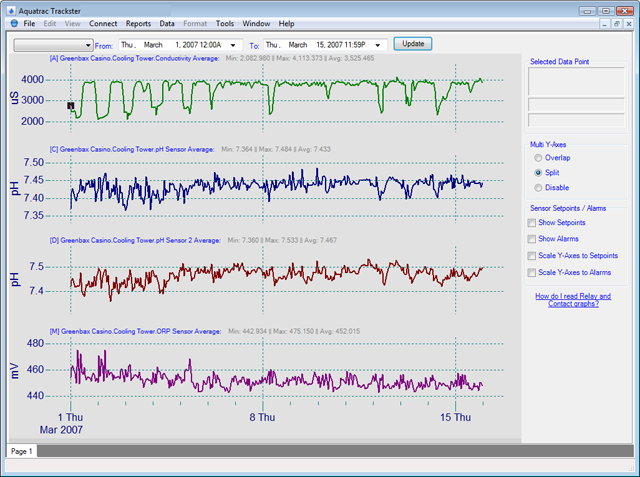 Demonstrates how to configure a relay (chemical pump) for a Timed Cycling application. Demonstrates how to configure a relay (chemical pump) for a Prebleed Lockout application. Demonstrates how to setup a relay (chemical pump) for a Percent Time application. Demonstrates how to setup a relay (chemical pump) for a Holding Time application. Demonstrates how to setup a relay for a Captured Sample application. Demonstrates how to setup a relay (chemical pump) for a Bleed-Then-Feed application. 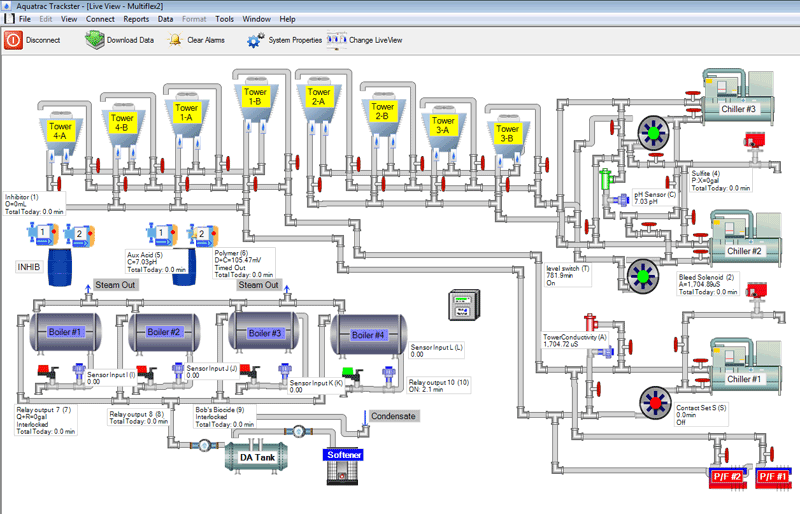 Demonstrates how to configure a relay (chemical pump) for a Bleed And Feed application. Demonstrates how to setup the email server settings. The email server settings are used when you setup AutoPoll to email out historical data and/or alarms. Demonstrates how to import your own image into a LiveView. Demonstrates how to run the Trackster AutoPoll Manager to start the schedules that you have created for Historical Data and Alarm collection. Demonstrates how to enable and disable inputs and output on a controller using the Trackster software. Demonstrates how to download historical data from a controller via LiveViews. Demonstrates how to download historical data quickly - The Direct Download procedure is useful for when you simply want to retrieve historical data from a controller without having to connect to the controller via LiveViews. Demonstrates how to create a LiveView. The concepts learned in this video will help you create a LiveView that is specific to your cooling tower and/or boiler system. Demonstrates how to create a custom formula and then use that formula in a report. Demonstrates how to configure a relay (chemical pump) to turn on/off based on Time. Demonstrates how to setup a relay (pump) to be controlled by the values of a analog sensor (pH, ORP, Conductivity, etc). Shows you how to reset all Multiflex passwords using an Upgrade Code. To receive an Upgrade Code, send a request to support@aquatrac.com and make sure you include the Serial Number of your Multiflex controller. Explains how to download and capture Multiflex historical data using HyperTerminal. Shows you how to give all users Write persmissions (or Full Control) to the Trackster 3 database. This video is helpful if you are receiving an error message (Operation must use an updateable query) when attempting to add a System (or Site) and/or a Controller to Trackster Explorer. Shows you how to configure AutoPoll to collect historical data from a controller. AutoPoll Historical Data is useful for when you want to automatically collect and import historical data into Trackster. Also, you can email out historical data to colleagues that do not have a connection to the controller. Shows you how to configure a controller for AutoPolling Alarms. AutoPolling Alarms will allow you to be notified via email and/or cell phone when an alarm occurs on the controller. Shows you how to Zoom In and Zoom Out on a report page. Zooming is useful when you need to need to see more detail on a trend. Shows you how to open a controller's System Properties page. The System Properties page is where you can view and/or edit the controller's clock, diagnostic info, dial-out information, etc. Shows you how to configure a relay to turn on/off based on the volume reading a meter. Shows you how to configure a relay for feed verification. Shows you how to import controller historical data into Microsoft Excel in a readable columnar format. Shows you how to fix the 'Conversion from type 'DBNull' to type 'Integer' is not valid.' error that may occur in Trackster 3 when creating a new Formula. To install Trackster 3.2, you must have a valid Trackster 3.2 Serial Number (or Product Key). If you do not have a Trackster 3.2 Serial Number you can aquire one by contacting Aquatrac Instruments. If you are experiencing problems with downloading the file below or you need assistance, please contact Aquatrac Instruments at 800-909-9283 or email support at support@aquatrac.com. The Trackster 3.2 program requires Microsoft's .NET Framework 2.0 and Microsoft's MDAC 2.8. If you do not have these programs already installed on your computer, you can download them from Microsoft's website. The download below includes the Trackster 3.2 Installer only. If you don't feel comfortable with installing the Microsoft program's yourself, feel free to contact Aquatac Instruments for a Trackster 3.2 CD. The Trackster 3.2 CD includes all the Trackster 3.2 requirements. During the Trackster 3.2 installation process you will be required to enter a valid serial number. Please contact Aquatrac Instruments if you need a serial number. Run the "setup.exe" installer by double-clicking it. Note #1: You do not need to uninstall your current version of Trackster 3.2 prior to installing the new version. Also, you will NOT lose any existing data. Note #2: If you expect non-Administrators to be using Trackster, it is critical that you confirm that all users have Read/Write access to the Trackster database. Follow the instructions in the Configuring Trackster 3 Database Permissions video to learn how to give all users "Full Control" access to the Trackster database. If you receive an error (during Trackster 3 installation) that says something like "This setup does not support installing on this operating system", more likely than not, this error is caused by the Windows XP Operating System and the MDAC 2.8 Installer. Open the folder named "MDAC28"
Right-click the file named "mdac_typ.exe"
Select the checkbox named "Run this program in compatibility mode for:"
In the drop-down box (in the Compatibility Mode area), select "Windows 2000"
Fixed graph report for DCM500 meters (this update will now display flow rate for all meters instead of just volume). Fixed bug with the auto-boot of the AutoPoll feature. This bug only occurred on Windows Server operating systems. Fixed bug that would send duplicate Alarm email notifications via AutoPoll. Fixed a memory leak bug in AutoPoll where the memory (RAM) usage would continue to increase until Trackster would crash. Added feature where the user can specify whether Trackster will auto start AutoPoll when Trackster boots up (refer to config.ini located in the Trackster root directory). Fixed the bug that displayed a blocking relay of Relay #1 when a Relay was actually configured to be blocked by Relay #10. Updated the "Unable to connect to Aegis controller" message that occurred when a DCM connection failed so that it doesn't contain "Aegis". Fixed the error "Attempted to read or write protected memory. This is often an indication that other memory is corrupt." Updated the demo controllers' IP Address to their corresponding domain names. URL Encoded the password string that gets passed to the DCM500 and Aegis controller - However, the Aegis firmware will need to be updated in order for this fix to be fully realized. Fixed the error that reads "This application is using an unlicensed version of IP*Works!" when dialing a PPP connection to an Aegis controller. Fixed the incorrect display of Relay and Contact data in Reports. Relay and Contact data were being displayed in seconds instead of minutes. Fixed the display of Contact Controlled relay's in a LiveView Data Label - The ontime of the Contact was displayed in seconds instead of minutes. Fixed incorrect display in reports on Aegis meters. The bug calculated meter data as though it was contact switch data (divided by 60). Fixed bug that occurred when downloading data from a SmartSeries controller where the Site Name or Controller Name (on the physical controller) was not the default value of Aquatrac/SmartSeries respectively. Automatically set Full Control permissions to the Trackster database directory. Only works if current user has permissions to do so. 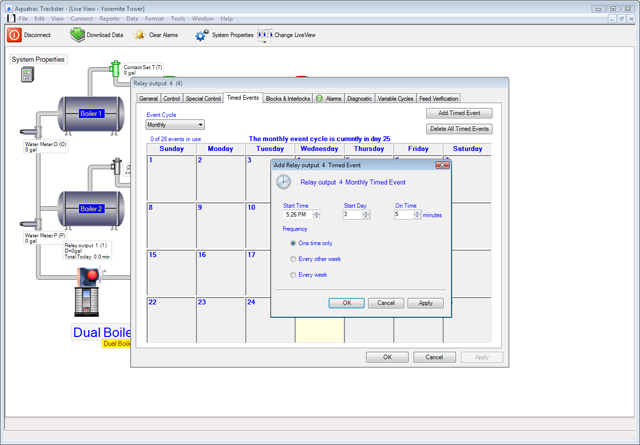 Added Hourly Data Poll to the AutoPoll Schedules. Trackster would fail connecting to SmartSeries controllers if the Site Name or the Controller Name was changed from default. Problem fixed. Bug fix for Report Formula's that contained more than one parameter within a divisor. Microsoft Windows 2000 Pro Edition, XP (Home or Pro Editions), or Vista (32bit or 64bit) installed and configured on your system.